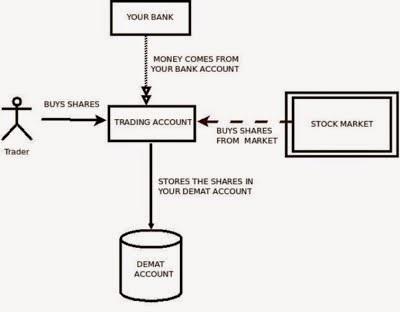 In kerala India, shares and securities are held electronically in a Dematerialized "Demat" account, instead of the investor taking physical possession of certificates. A Dematerialized account is opened by the investor while registering with an investment broker (or sub-broker). The Dematerialized account number is quoted for all transactions to enable electronic settlements of trades to take place. Every shareholder will have a Dematerialized account for the purpose of transacting shares.Access to the Dematerialized account requires an internet password and a transaction password. Transfers or purchases of securities can then be initiated. Purchases and sales of securities on the Dematerialized account are automatically made once transactions are confirmed and completed. Just as bank accounts hold money, demat accounts hold equities. Demat stands for Dematerialisation. Earlier investors used to hold shares in paper format, Nowadays they are stored electronically in your Demat account. You cannot put money in demat account, only equities.